The primary motivation for the UK Alliance for Disaster Research (UKADR) is to bring together the UK's rich and diverse disaster research community. This will facilitate collaboration and partnership to aid representation of the research community at government level in the UK, and, where appropriate, help with the implementation of the Sendai Framework for Disaster Risk Reduction. The Alliance is independent and managed by voluntary contributions from the UK research community. Membership is open to staff and PhD students of any research-and-capacity-building institute based in the UK that is active in researching disaster risk and its management. This includes universities and other educational institutions, charitable trusts, think tanks and research departments within government agencies, private businesses or civil society organisations. Disaster risk reduction, prevention and preparedness, disaster response, reconstruction and recovery are all of interest. 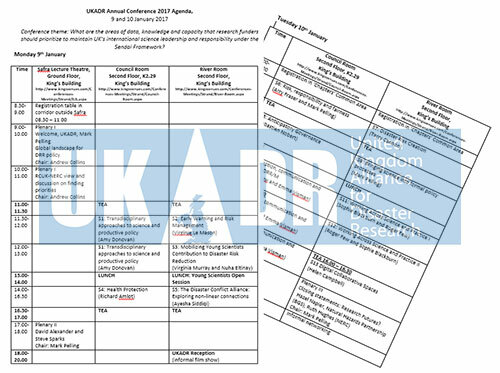 UKADR second annual conference — 27–28 March, 2018. Individuals who have submitted panel and paper proposals will be contacted shortly confirming their participation. General registration for the 2nd annual UKADR Conference is now open.